Thinking of building your own spring floor? You can save money, but you will need do your homework so that your finished product will be responsive and problem-free. One of the biggest issue most confront will be finding the proper plywood that is appropriate for spring floors. The type most all commercial manufacturers use is Baltic Birch (sometimes called Russian Birch). This type of wood is strong, resilient, and resistant to warping or cracking. The ideal thickness is 3/8" (or 9mm). We would not recommend using wood thicker than 1/2", if you intend to use the standard dual layer system used by most gyms today. Your total thickness of the combined layers should not exceed 1" for the most responsive floor. The 5' x 5' size is easiest to work with. The bottom layer of wood has the springs attached to it; the top layer is the offset layer which ties the floor together as one unit, providing uniformity of rebound. These layers can be connected by velcro or screws. Velcroed floors flex more easily and are generally preferred because they are far easier to remove, repair or relocate. You can assemble your floor more quickly and cheaper by connecting layer to layer with decking screws, but moving, repairs, additions are much more difficult. If you choose to use screws, use as little as possible. The more screws you use, the harder or less responsive your floor will be. 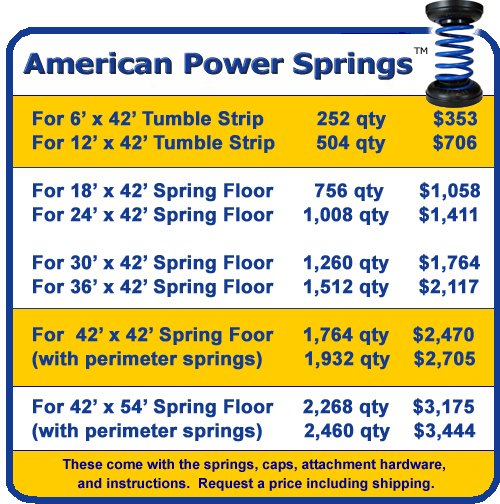 As for the springs, easily the best on the market is the American Power Spring™ (with the distinctive blue coil). It is the best selling floor spring in the world. It features a durable, hard drawn high carbon steel, 2" x 4 1/4" coil with newly-designed durable plastic retainer caps. Our springs are resilient enough for gymnasts of all sizes and abilities. The hardware required (3 pieces) for each spring is included. The advantages of American Power Springs™ are that the caps are more robust, the coil paint does not flake, top and bottom caps are interchangable, they are easier to see in dark habitats (such as under your floor), and they ship far sooner than competing springs which may take months to ship. The American Power Springs™ normally ship within just a few days of your order - if not the same day. We can supply pricing of any quantity you like. Just request a price below! This is the world's most popular Floor Spring. The Caps, Spring and Hardware all ship together! They are $1.40 each (plus shipping). We can ship any quantity. Request a delivered price below. There are two schools of thought regarding the number of springs you need. Most think that you just need one per square foot. Some think that you need an extra spring along the perimeter. Generally, the gymnastics field has a stronger preference to the extra (perimeter) springs. We offer both of these options. Just let us know your preference when requesting your delivered price. We will need to know, at the time of your order, what the thickness of the bottom layer of your floor will be ... so we can provide the proper attachment hardware. If you are unable to source Baltic Birch in your area. We can supply it. Learn more here. If you would like to assemble your floor (wood layer to wood layer) with Hook and Loop, you also can request a price for this at the above link. The Velcro comes in rolls 4" wide by 25 yards long. You will need to cut it in lengths of 4" or 8". We recommend a power or pneumatic stapler to attach these to your wood. 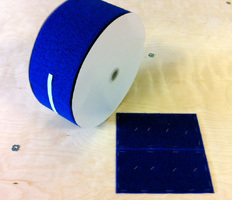 We also use and recommend using an all-purpose adhesive as well. We like Loctite PL375, but you can use anything similar. It comes in tubes that fit in caulking guns for easy application. You can find this product at your local hardware store. We can calculate how much Hook and Loop you will need, but see the list below for some of the more common sizes. Assembling with hook and loop takes much longer than assembling with screws, but it will provide a more uniform (and maximized) engagement of the springs across your floor, as well making the floor much easier to move should it become necessary. Shipping is not included in the above chart. You can make a purchase of these by visiting here. FYI - Traditionally, the Loop Velcro is attached to the top of the Springed Boards and the Hook Velcro is attached to the bottom of the Top Boards. To cover your decking, be sure to check out the Carpet Bonded Foam, Flexi-Rolls®, or Carpet and Foam pages.